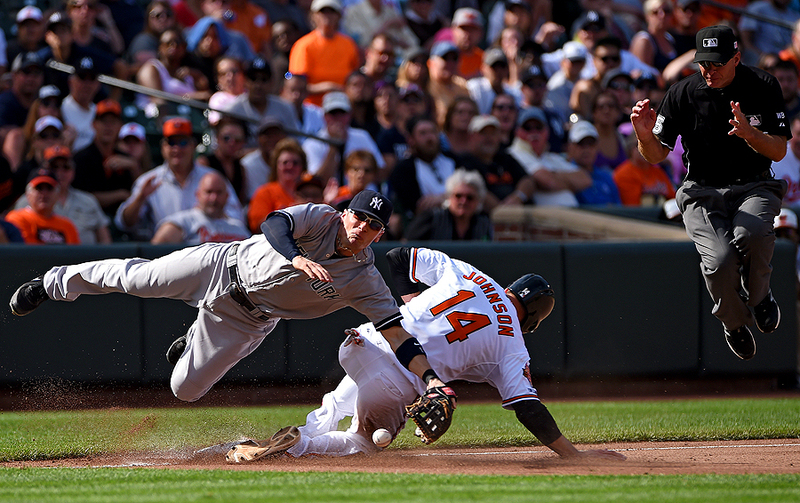 "Third base umpire Ed Hickox #15 jumps into the air as Kelly Johnson #14 of the Baltimore Orioles slides safely into third base while third baseman Martin Prado #14 of the New York Yankees cannot control a throw in the eighth inning during game one of a doubleheader at Oriole Park at Camden Yards on September 12, 2014 in Baltimore, Maryland." Baseball is a game of silent emotions and they happen often, but quickly. The action is also great too, but in a game of good pitching, it can be sparse. In a duel of good throwing, a steal made the action image of the game between the New York Yankees and the Baltimore Orioles. Much like emotions, when action happens, it happens fast. Being able to anticipate and compose the frame before it happens is half the battle. After the safe slide into third base, all the photographers looked to the back of their cameras to see what happened. A miss-thrown ball resulted in everyone jumping into the air. Usually I'd clean up the frame by cropping in tight, but the umpire also jumping added another visual element I enjoyed. 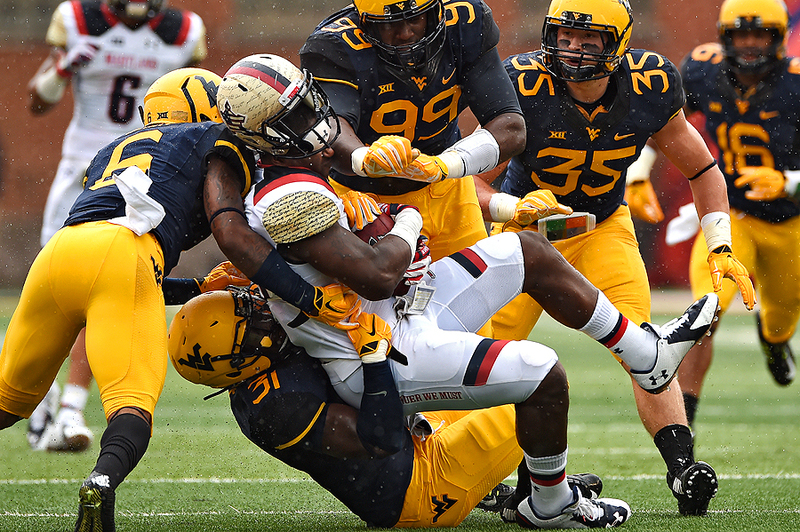 "Tight end Andrew Isaacs #44 of the Maryland Terrapins is hit by linebacker Isaiah Bruce #31 of the West Virginia Mountaineers and teammates in the second quarter during an NCAA college football game at Capital One Field at Byrd Stadium on September 13, 2014 in College Park, Maryland." Every level of sport is completely different than the rest - especially with football - and it's easy to notice the difference in level of skill all the way from pee-wee to professional. College football is a lot of fun - it's very fast paced with lots of emotion. While no sport is easy to predict, college football with the option play, can be a challenge to document alone. For the past couple years, a majority of the football games I cover are with a teammate. The field is split and it puts the stress level down a notch. While we usually have every play from two angles, the most dynamic images are when they unfold right in front of you, rather than across the field. So covering college football alone makes one prepare and really pay attention to the game and the plays that are happening so that you can better place yourself on the field for success. the West Virginia Mountaineer. A sea-saw battle, the weather and the high-scoring event made it a lot of fun. 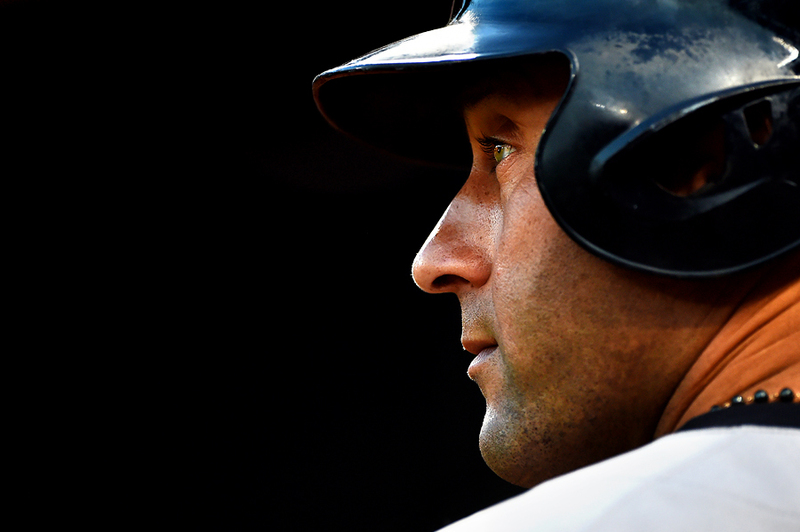 "Derek Jeter #2 of the New York Yankees looks to the field before batting against the Baltimore Orioles during game two of a doubleheader at Oriole Park at Camden Yards on September 12, 2014 in Baltimore, Maryland." There is and will always be something thrilling about documenting the athletic superstars. Having the opportunity to be close to athletes doesn't do much for me - I don't get star struck. At the end of the day, they're insanely talented at their craft, but they're humans like the rest of us. However, I know most fans would give anything to have our daily access. So when I have the chance to shoot a intimate, tight and candid portrait of the big names, I do so. I feel as if seeing them in action is one thing, but to see them up close and personal with clarity and detail helps viewers get a sense for who they are. Derek Jeter of he New York Yankees is one of those sports legends. I didn't have a chance to document the start of his career like my peers, but I'm humbled to have been able to share with the world images I made of him on the field in recent years. Considered one of the best of this era, Jeter has broken many records, but more importantly in my book, he is a class act athlete. I've always been told, no one will remember your work, they'll remember you as a person. During Jeter's last series in Baltimore, I made it a point to shoot a lot portraits so that the images can help tell his historic career is a quiet way. 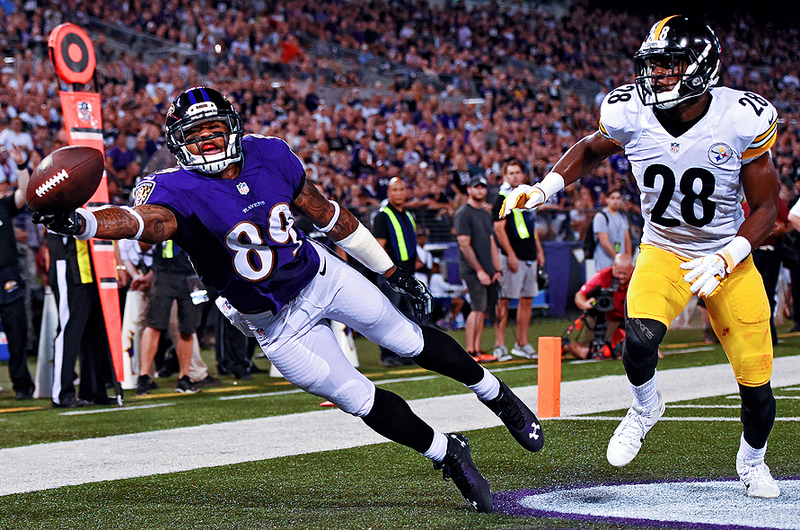 "Wide receiver Steve Smith #89 of the Baltimore Ravens misses a touchdown pass in front of cornerback Cortez Allen #28 of the Pittsburgh Steelers during second quarter at M&T Bank Stadium on September 11, 2014 in Baltimore, Maryland." In sports, sometimes it's the plays that go wrong that are the most visually appealing. Everyone wants to see the game-winning touchdown in football. In soccer, they want to see the bicycle-kick that knotted that game late in the second half. And in motorsports, it's the final victory burnout. The problem is, while those moments are incredibly important to history, sometimes they aren't always the most aesthetically appealing. It's worth noting that telling moments always trumps visually compelling pictures - it's just getting those two elements together to make the best frame possible. Other games, it's the botched play that a lot of the time makes a interesting photograph. And while we as photographers celebrate when those odd plays go right in the end, it's sometimes simple, small struggles during the game that make a picture. Near halftime of the Pittsburgh Steelers taking on the Baltimore Ravens game, Steve Smith of the Baltimore Ravens missed, a what would have been, amazing touchdown catch. This picture may make others ask questions, and as a photographer, we wish he would have caught the ball to make it more important in the hierarchy of pictures that night. But even though he missed the catch, it doesn't make it a bad image and we always need to remember that even the mundane, poor play is still meaningful in someway. "First baseman Steve Pearce #28 of the Baltimore Orioles makes a catch on a hit by Trevor Plouffe #24 of the Minnesota Twins (not pictured) in the second inning at Oriole Park at Camden Yards on August 29, 2014 in Baltimore, Maryland." 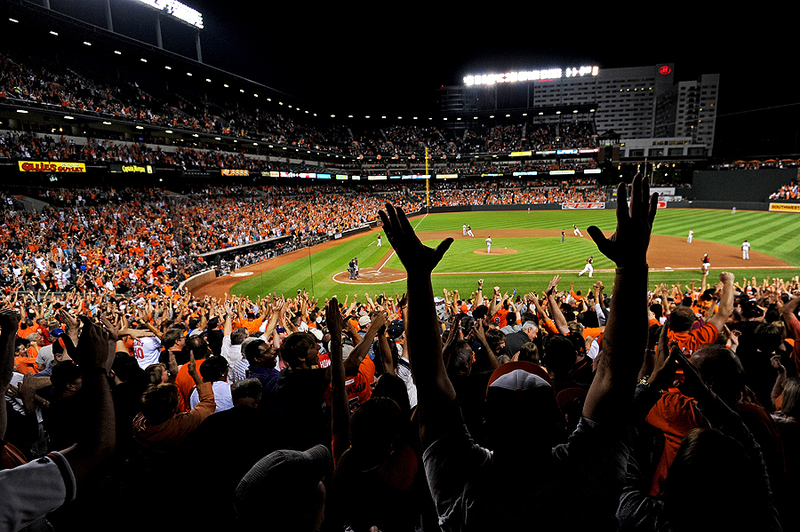 It's an exciting time in Baltimore as the Baltimore Orioles look to win their division for the first time in a long time. As with every year, we photographers spend a lot of time at the ball park documenting the ups and downs of the season, for not only the Orioles, but incoming teams, too. Each and every game, we're always looking for the big play - whether it's a hit, score or catch. For the latter, photographers are always hoping to get that amazing catch in the outfield or a sprawled out dive in the infield. We are also aware of foul balls close to the stands, and for Steve Peace of the Baltimore Orioles, he was also aware of the stands. 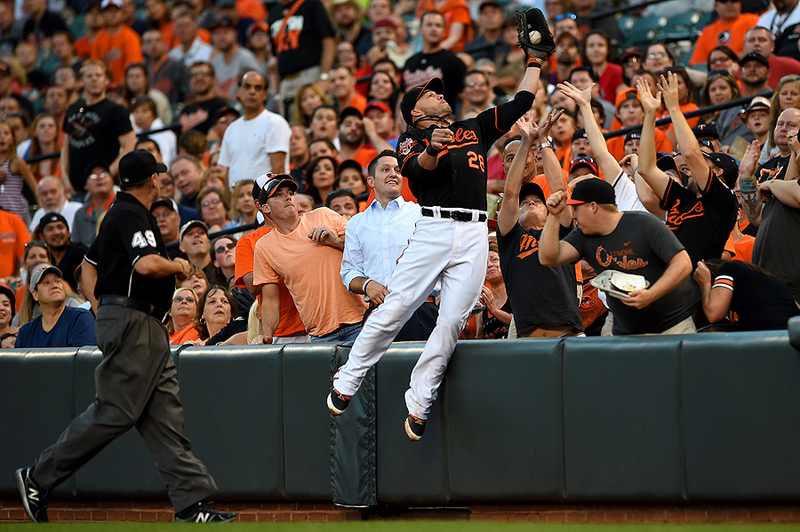 He made a terrific catch against the Minnesota Twins, which remarkably he did not fall into the crowd. With plays like this, the Orioles are only a few games away from winning the American League East division - and it will be interesting to see how far the birds can take their team into the post season come October. "Outside linebacker Terrell Suggs #55 of the Baltimore Ravens wears a mask as he is introduced before playing the Pittsburgh Steelers at M&T Bank Stadium on September 11, 2014 in Baltimore, Maryland." One of the best things about photography is that you never know what is going to happen in front of the lens. What was seeming like another typical introduction before the Baltimore Ravens played the Pittsburgh Steelers took a quick turn. Outside linebacker Terrell Suggs of the Baltimore Ravens got a huge eruption of cheers right before coming out of the tunnel. A quick glance at the video board and I wasn't quite sure what I was looking at. 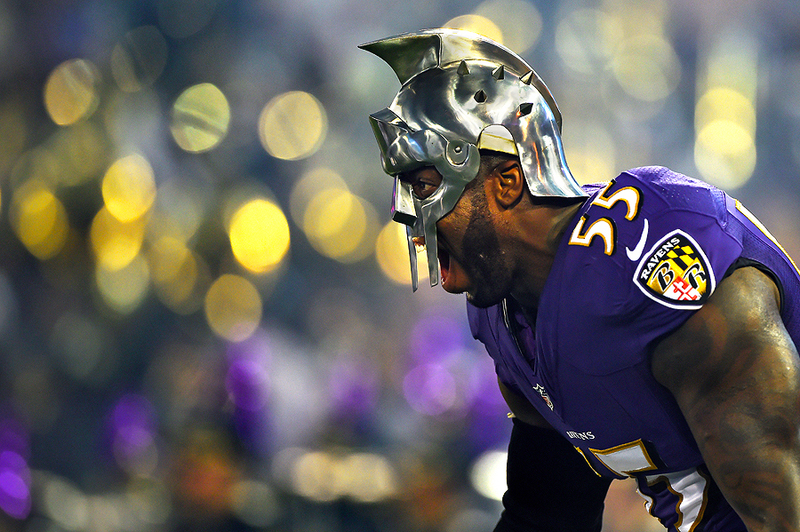 But as Suggs came sprinting out of the foggy tunnel, we all realized he was wearing a gladiator type mask to not only ramp up the crowd even more, but his teammates, too. Sometimes it's the little things that make the ritual thing, in this case a prop, that makes introductions a lot of fun. 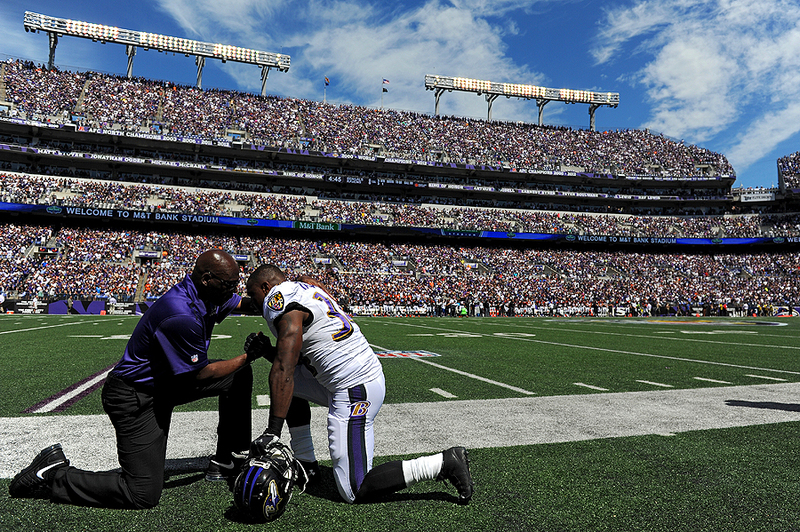 "Running back Lorenzo Taliaferro #34 of the Baltimore Ravens prays with a coach prior to playing the Cincinnati Bengals at M&T Bank Stadium on September 7, 2014 in Baltimore, Maryland." As a photographer, a lot of thoughts run through one's mind before the first game of a new season. For players, I'm sure it's no different. New to the league, and looking to rush for the very first time, rookie running back Lorenzo Taliaferro of the Baltimore Ravens took time with a coach to have a moment to themselves just seconds before kicking off the 2014 season. I could only imagine what they were thinking about, but I assume it was to be safe amongst other things. These type of quiet moments not only gear me up for the game, but they inspire me to continue to tell the stories of religion in sports and how moments like these bring the entire sporting world together. Excited for the rest of the season and looking forward to the big time action - and meaningful moments on and off the field. "Fans celebrate as Chris Davis #19 of the Baltimore Orioles runs the bases after hitting a grand slam home run against the Minnesota Twins in the fourth inning at Oriole Park at Camden Yards on August 29, 2014 in Baltimore, Maryland." One of the most overused statements I get from fans is that they think to take good pictures they need to be field level with a giant telephoto lens. That cannot be further from the truth because each and every week I shoot from a distance with a wide angle lens and still able to document telling moments. During a recent Orioles game against the Minnesota Twins, I decided walk the concourse to get a different perspective than the rest of the photographers. With the bases loaded, and big time slugger Chris Davis of the Baltimore Orioles hitting, I knew I wanted to shoot the overall scene. Fans always react to big plays, yet a grand slam home run is as big as it gets. I stood on an empty chair and waited for either the grand slam or a strikeout. Had Davis done the latter, it wouldn't have been anything to share. But it was a risk that paid off and ended up being the picture of the game. "A race fan poses for a portrait ahead of the NASCAR Sprint Cup Series Irwin Tools Night Race at Bristol Motor Speedway on August 23, 2014 in Bristol, Tennessee." Much like any sport, there are diehard fans that travel to every single game, match and race. This is no different in the world of NASCAR. 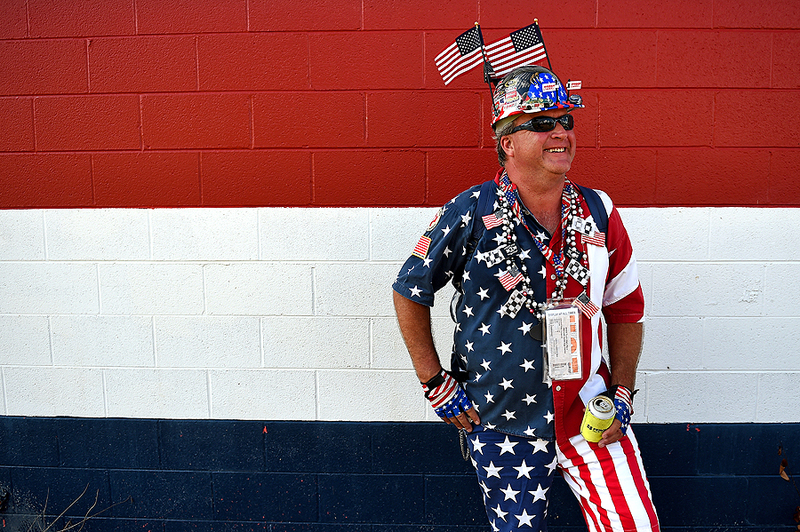 Most of these iconic fans are seen on a weekly basis - and it's hard to ignore them with their flashy outfits. Almost every single one of these characters have been photographed more than any other person at the track on any given weekend, but they help visually tell the story. After making a quick connection of this race fan and a wall he was walking by, I asked him to pose for a portrait. It's always fun to step away from documenting candid moments to pose a subject for a graphic portrait.